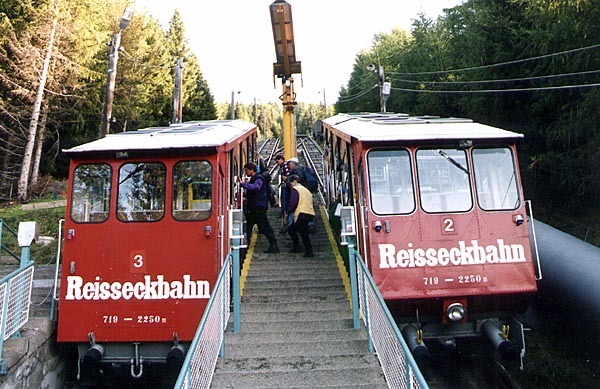 It is also a one track section with one cabin. The particularity is that the drawing of the section is like an elbow. 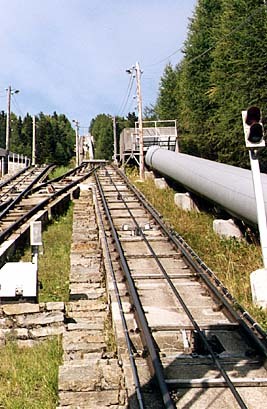 As the first section the profile of the track is made of concavities and convexities. There are two porticoes (as this one on the right) as the first section. 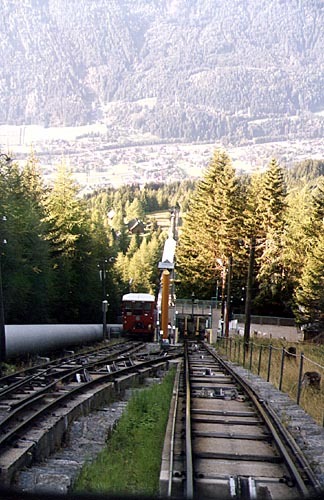 The length of the section 2 is 1260 meters and it is the longest section of three funicular sections. The difference of levels is 535 meters. At the Trog station you have to get out from the cabin 2 and get in the cabin 3 which is just beside the other one. 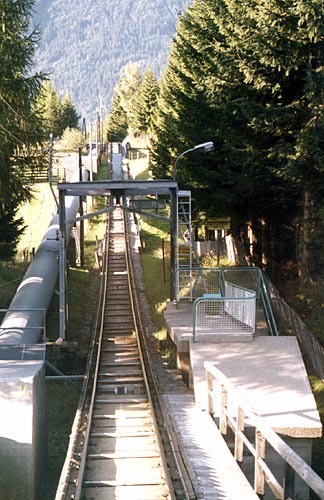 You can notice that at the Trog station the configuration is reversed compared at Schütter station, the going up cabin (cabin 3) is on the left side of the station. Between the cabins a small crane is used to transfer heavy loads from one cabin to the other one. Behind the crane you can see a third track which is used to pass the cabins from one section to the other one. The section 2 is the track on the right, the section 3 on the left. Above the section 2 you can see the outcome of the section 3. The question is: where is the power house of the section 2? Good question!... The power house of the section 2 is on the left of the section 3, outside the photo! The cable of the section 2 has to pass under the track of the section 3! 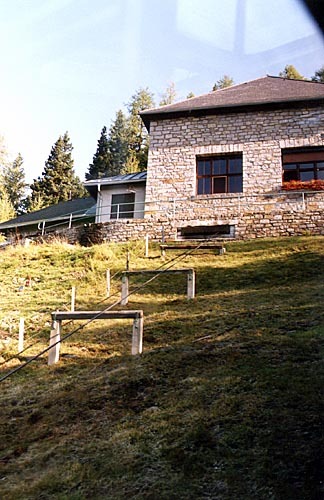 The section 2 (on the left) with the cabin 2. As the one of the section 1, the cable rests on horizontal pieces of wood before entering the building through a slot.